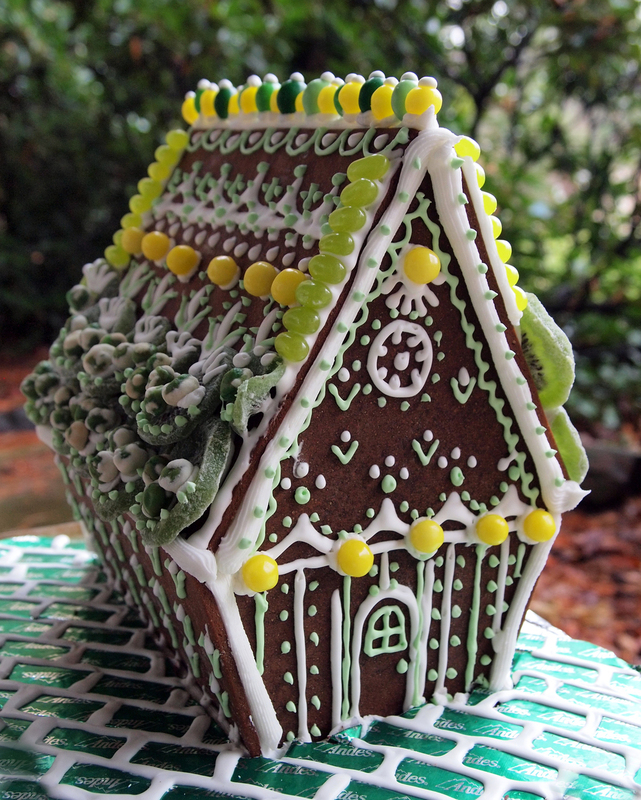 This is the first of three posts in our gingerbread house series. Read the second, on templates and construction, here, and the third on decorating, here. Have you ever made a gingerbread house before? If you haven't, is it because the whole process intimidates you? Fear no more, we are going to walk you through different stages of making a gingerbread house; rounding up recipes, templates and decorating ideas right here. I have always thought that gingerbread houses were so magical. As a kid, I would ask my mother to make one all the time. We did it once. From a kit when I was about 7, and then never again. Don't get me wrong, my mother and father indulged my creative projects, I definitely don't fault them for not making elaborate gingerbread houses every year. It takes planning, and consideration, and time--certainly an intimidating prospect unless you break it down into steps. It also helps to have a little experience under your belt, but in my case as well as yours (I'm sure) dreams and imagination will suffice. I guess all those years of dreaming about gingerbread houses filled me up with big bank of gingerbread plans and I was only waiting to get my hands on some royal icing and candy as an adult. I have made gingerbread houses in so many ways since then. I found out that my mother-in-law used to let Ben make crazy gingerbread houses every year, ninjas included, so I made one with her while we were in college. This was the easiest gingerbread house I have ever made. Largely beacuse I didn't really make it, I showed up to her house and a gingerbread house shell, bowls of candy, and royal icing awaited my arrival. If you can get a deal like this, I highly recommend it, but I think chances like these are few and far between (Thanks, Jane!). Another year I used a kit with my cousin Brianna, where you press the dough into bas-relief style molds and it creates the texture of a roof and doors and windows. You just put it together and decorate. I will say I totally understand the draw of these kits, they look so easy! I am going to tell you that that attempt was one of the most time consuming, and complicated baking experiments of my life. Since then, I make up my own templates. I don't go completely overboard, but I want the shape to be unique and my house to approach the idea I have in my mind. Over the next few posts, I am going to give you some templates for structures, tips I have acquired over the years on gingerbread house building, and a run down on how to use candy to decorate your house (which I think is a big block for some people). Today I am going to go start with the recipes I use for structural ginger bread, and royal icing. The MUSTS of gingerbread houses. Just a note, these houses will not be edible; they are made from edible materials and you can try to eat them but you may break a tooth and the reward for your broken tooth will be gingerbread that tastes like there is way too much flour in it. Start pinning your dream gingerbread houses, look over these recipes, gather the ingredients and check back next week for the templates and the next steps to making your gingerbread houses! To prevent parchment paper from slipping, wipe counter with wet sponge then place parchment paper over damp counter. This will prevent the paper from slipping while dough is being rolled out. Working with one half of the dough, roll onto parchment paper that has been sprinkled with flour. Sprinkle dough with flour to prevent dough from sticking to rolling-pin. When your dough approaches the 1/4" thickness, move the dough (still on parchment) to your cookie sheet. You'll be cutting your shapes out on the cookie sheet and removing the surrounding dough to limit moving the pieces. The less you move the pieces, the more likely they will stay true to your template shapes. Roll dough to about 1/8” thickness. Sprinkle more flour on the dough. Place the pattern pieces onto dough and cut-out dough pieces. Remove excess dough pieces, knead together and wrap in plastic, you’ll be using it in a moment to make the other parts of your gingerbread house. If your pattern has stuck to the dough at this point, refrigerate for 15 minutes, it should be easier to remove the pattern pieces. Place cookie sheet in fridge for 15 minutes to allow dough to firm up again. Place cookie sheet in oven. Check frequently to prevent burning. Bake until golden brown (better a little overdone than under done). Large pieces may bake as long as 14 minutes. Smaller pieces might take 6 – 7 minutes. Unused dough may be wrapped in plastic and refrigerated for up to 2 weeks (bring to room temperature and knead briefly to use again). When dough pieces are done baking, remove baking sheet from oven. Make sure the shape is still straight, fixing them now if needed while the dough is soft enough and still on the cookie sheet. Quickly lift paper from baking sheet and place on a wire rack to cool (Make sure this is a flat surface, I have some old cooling racks that I wouldn't exactly call flat. If the pieces warp they will be really difficult to match up with the other parts of the house). If pieces have curled up during baking, while still warm, gently push edges down to lay flat. When gingerbread pieces are completely cool carefully peel the parchment paper off the bottom. I base my royal icing on this recipe from the Joy of Baking. Her recipe is for icing and flooding cookies, at this stage we are using the royal icing as glue so it needs to be much thicker than the original recipe calls for. That is a great thing about royal icing, add more sugar to make it thicker and more water to make it thinner. You can also use Meringue Powder or egg whites. Since eating raw or undercooked eggs can give you salmonella, I usually use meringue powder when I am going to eat the cookies, for the gingerbread houses it doesn't matter as much since I am not going to eat them. I'll be using egg whites for this recipe. Royal icing needs to be used immediately, it dries quickly when it's in contact with the air. While I'm using it, I just place plastic wrap on the surface of the icing to limit the exposure to air, if I am going to use it the next day I keep it in the refrigerator in tupperware. Look at the consistency of your icing; is it thick like caulk or closer to Elmer's Glue? For this stage you want it to be like caulk, adjust your recipe as needed by adding more sugar or some water. A little water goes a LONG way, so do this slowly and add only a little bit a a time. Add your icing to a pastry bag with a wide tip, or just snip the end off and use the bag on its own. You are ready to build. When building, go slowly and be patient. Assemble your walls and attach them to your base and each other, then wait for at least 20 minutes before you attach your roof. Fill in any gaps will royal icing and if you'd like, run a line of royal icing along the seams to cover up any imperfections on the seam. This icing should look like caulk, and hold its shape. Now look at the consistency. I'd say it should be like Elmer's Glue at this point. It should run off of your mixer in a steady stream. This should be close to Elmer's Glue consistency; it will run in a stream from your mixer and then stay on top of the surface of the icing in the bowl (for a little while).